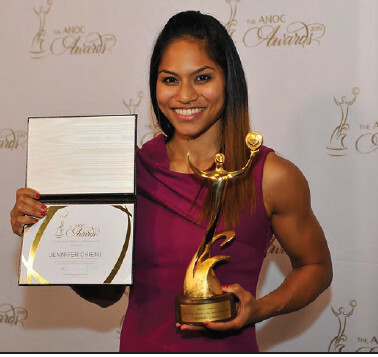 Jennifer Chieng, FSM female boxer, from Yap State, FSM was awarded the ANOC 2015 Pacific Games Female Athlete of the Year Award at the Association of National Olympic Committees (ANOC) annual general assembly on Thursday, October 29th in Washington DC, USA. Chieng won a gold medal in Boxing at the recently concluded 2015 Pacific Games in Papua New Guinea. Her coach was Erick Divinagracia, President of the FSM Boxing Association. She is currently ranked #2 in Women's Amateur Boxing Lightweight division in USA. She is the 2015 NY Daily Golden Gloves Champion, Lightweight division, and the 2014 USA National Silver Medalist – Lightweight division. Chieng is training full time in New York City, NY, USA preparing to qualify for the Rio 2016 Olympic Games. She is one of 4 FSM athletes that have received, through the FSMNOC, a 2-year athlete training scholarship from the International Olympic Committee (IOC). The FSM National Olympic Committee (FSMNOC) is one of 205 NOCs that are members of ANOC. This was the first year that ANOC awarded male and female athletes of the year from the 5 continents of Oceania, Asia, Africa, Europe and Americas. Chieng, nominated by the FSMNOC, was one of 6 Oceania region female finalists. The Oceania National Olympic Committees (ONOC) Athletes Commission then selected the top three finalists and submitted to an ANOC Selection Committee who made the final selection. In early October, the FSMNOC and Chieng were informed that she had been awarded the ANOC 2015 Pacific Games Female Athlete of the Year. Chieng, and her 4 year old son Adam, attended the awards ceremony, along with FSMNOC representatives Berney Martin and Jim Tobin. Over 1200 sports leaders from around the world attended the ceremony which was broadcast live to over 120 countries. Prior to the ceremony, Chieng was presented a $25,000 check from FSM Congress from Vice Speaker Berney Martin. The money was given to Chieng to support the high training costs in New York. Chieng decided to take a one year leave from her job at the Bank of New York to focus on competing in the Olympic Games. She thanked FSM Congress Speaker TH Wesley Simina, Vice Speaker Martin, Yap FSM Senators Isaac V. Figir and Joseph J. Urusemal, and the members of the FSM Congress for their support. Although Jennifer may have moved from Micronesia to the US mainland she is still definitely 100% Micronesian. Regarding being a role-model and representing the FSM, Jennifer said: "I'm just very happy and honored that I got this chance to represent my country ...I would encourage the youth especially all of the young women and men to find what they are passionate about and pursue it. I love this sport and so I hope that this win will generate more interest in boxing and more participation by the youth and everyone in Micronesia."